A little late to the party, I finally planted some carrot, kale and lettuce seeds today. What took so long? I had to clear out the dead and dying summer plants first and amend the soil in the beds. Between recent hot weather, travel and laziness, today’s 70-degree weather was my first opportunity to garden in a while. I did get some peas planted a few weeks ago and those are coming along. So how did my summer garden grow? Wild. I had pumpkins everywhere, and there are still some long-neck canning pumpkins on the vine in my compost pile, waiting to be picked. 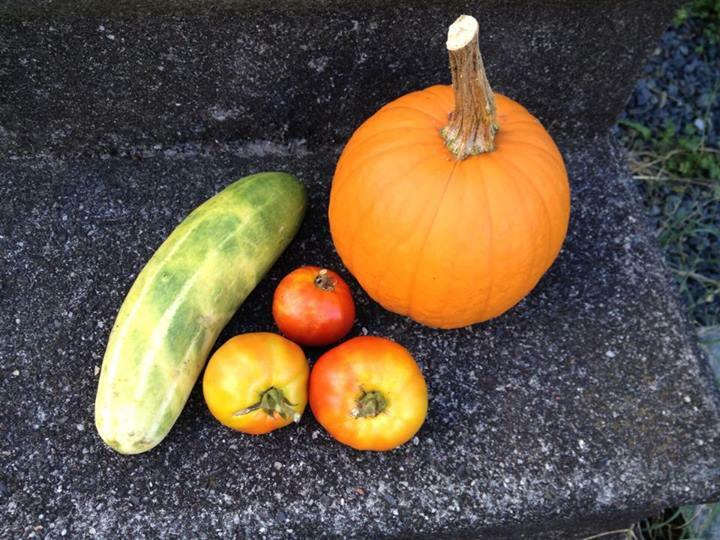 I got one usable baby pie pumpkin — pests got the other two that had ripened. Phooey. My tomatoes are still producing, so I haven’t cut those down yet. I finally pulled up the cucumber plants, but found a few cucumbers buried among the detritus that are hopefully still edible. I accidentally grew a cantaloupe plant (also a compost volunteer), but the solitary fruit it bore fell victim to pests in recent days. I was able to harvest some coriander (cilantro) seeds, which I’ll probably save for planting next year, rather than consuming. Lessons learned for next year? I still have a fair bit to do in the garden before wrapping things up for the cold season. I need to clean out around the beds and better prep them for next year. The landscape fabric alone didn’t do enough to keep the weeds down. I’m going to pull that up, remove the weeds and dig out still more hostas in the sunny corner of my garden. Next year, the area will get at least a good mulching, if not another covering of fabric before the mulch goes down. I’ve turned one large bed along my garage into a new compost pile that I want to separate into three caged areas for more efficient composting. I’m also composting a bed outside my kitchen (no food scraps though, since it’s so close to the house) that gets a lot of shade and has only grown weeds. I’m hoping to try lettuce, possibly in containers, there next year. I also need to clean up the fruit bushes I planted. The blackberry plants became very leggy and I didn’t do a very good job of training them onto the supports I set up. I need to tend to them and the only raspberry plant that pulled through. Not sure if I’ll try more of those next year. Some of you may remember that last summer I went on an allergen-free diet for a month before slowly re-introducing foods to discover what food allergies I have (eggs and a wheat intolerance revealed themselves). Well, I need to do it again. I’m having a reaction to something and it’s been a miserable couple of weeks recently. The suspects are dairy and processed sugar, the latter of which has only slipped into my diet on occasion. I’ve also been eating grains other than wheat, so those may be a culprit as well. So Monday’s the day I go back to eating only meat, veggies and a little bit of fruit. No dairy, alcohol, legumes or grains for a whole month. Honey will be my only sweetener. I plan on making lots of homemade, oven-baked sweet potato fries to help me pull through. I’ve been treating myself in the meantime. I splurged at the gluten-free bakery today and feasted on Chipotle’s chips and guac last night. Not sure what my beverage of choice will be tonight, but last night’s was red wine. I’ve already started stocking up on things to tide me over for the next month. I found myself eating way more protein than I normally would last time I did this. I bought a ton of chicken and ground bison today. I found beef sticks from Cedar Run Farm at the farmer’s market today and they have no preservatives or chemicals in them. Score! Perfect for snacking. I bought a bunch of kale and green beans, frying peppers and acorn squash to cook this week too. Bananas (not from the farmer’s market, of course), figs and raspberries will be my fruit splurges. Wish me luck! Deciding to pursue this diet is often harder than the diet itself. I know I’ll feel so much better a month from now. And I’ll be done before the holidays hit. Hopefully by then, I’ll have figured out whatever it is that’s causing problems so I can avoid it. Fingers crossed it’s not alcohol or cheese! Posted in Diet, Grow Your Own, Local, Sustainability, Vegetable and tagged allergies, blackberries, carrots, food, gardening, kale, pumpkin, strawberries, sustainability, sweet potatoes, tomatoes. Bookmark the permalink. I’ve just completed Week 2 of my allergen elimination diet and I’m already starting to feel better. Surprisingly, I haven’t had many cravings, but it was hard to walk by all the yummy pastries, breads and cheeses at the farmer’s market today. I consoled myself by buying a boatload of things I can eat, primarily meat. 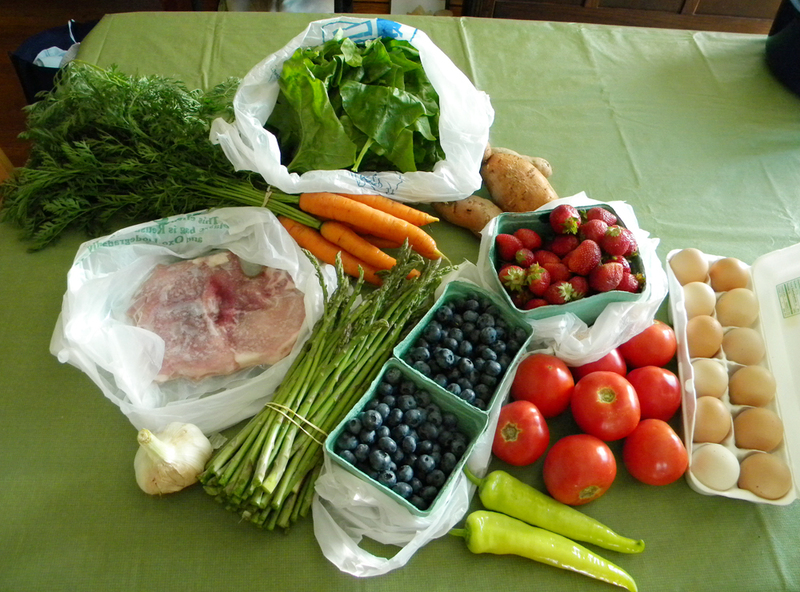 I took my loot home and had a quick breakfast of raw cashews and fruit salad made with the berries and some grapes. Then I was off to the library, the Amish market and the seafood market. The aftermath of the evening’s grilling. At my final stop, the seafood market, I bought their last large fillet of wild salmon and some large shrimp. 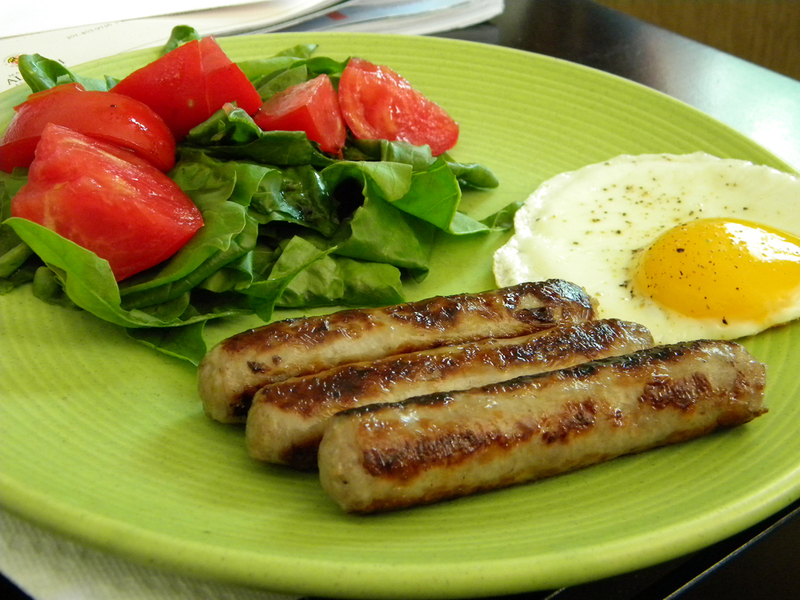 For lunch, I cooked the breakfast sausage along with an egg and ate that with a spinach and tomato salad. 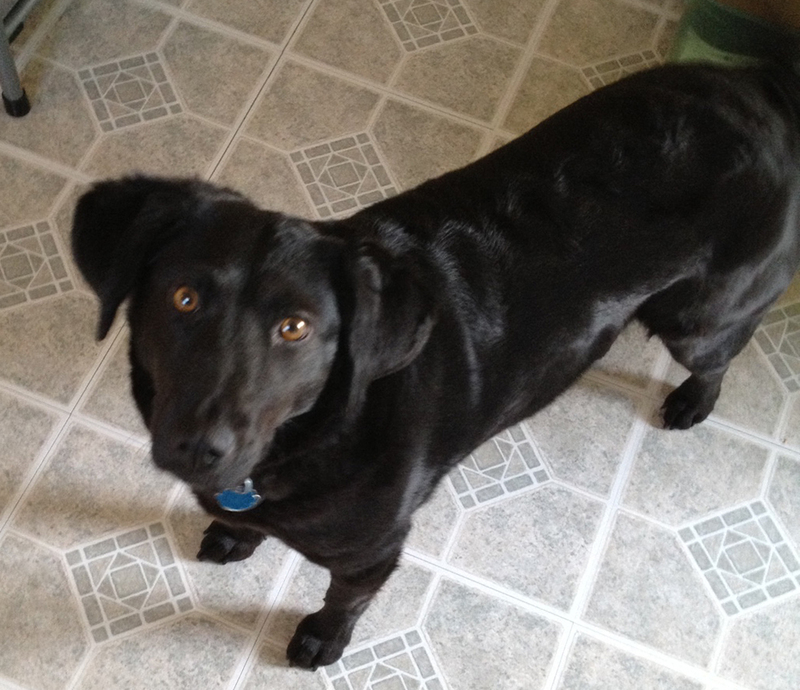 I divvied up the leftover sausage for breakfasts later in the week. I ended up cooking everything else at dinner. No, I didn’t eat it all — I just wanted to have everything ready for meals throughout the week. I grilled the filet mignon, pork chops and shrimp first. 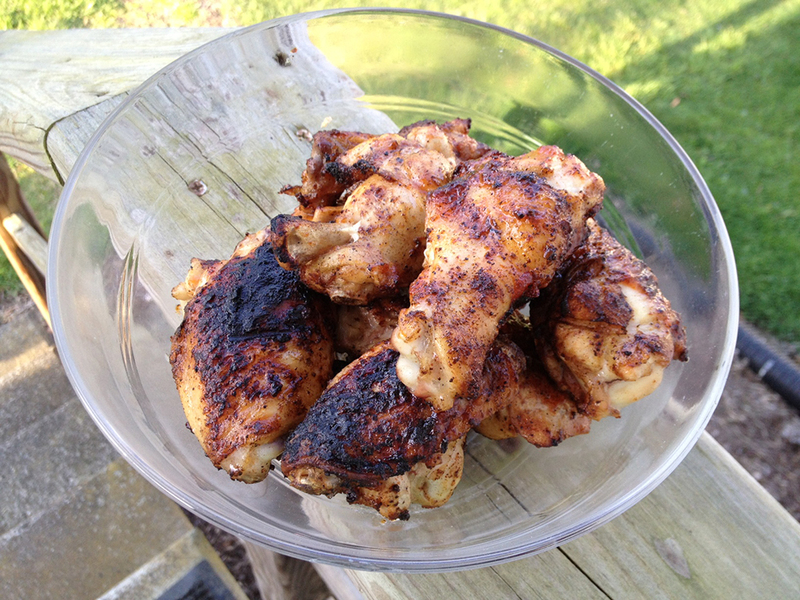 Then I threw some sliced sweet potato in the grill basket and grilled that. The coals were still hot, so I threw on the grilling sausage. Meanwhile, I broiled the salmon with a curry sauce on top. 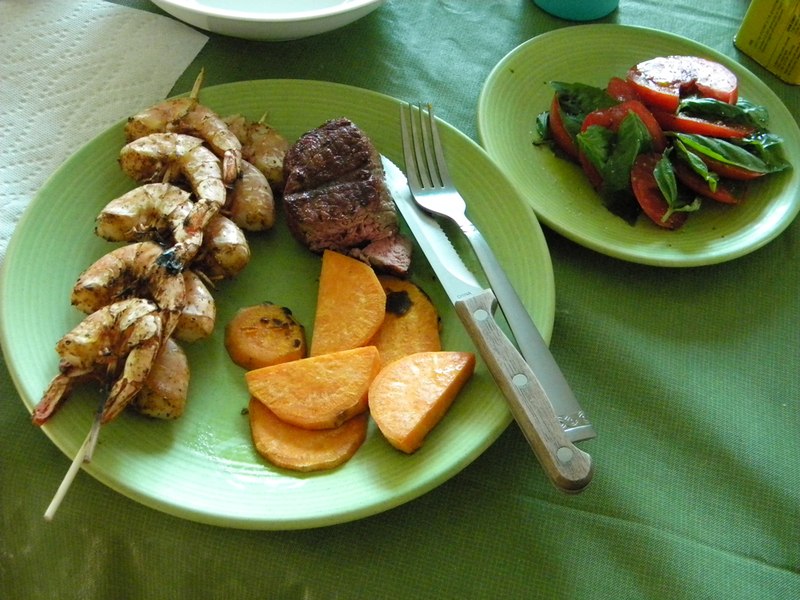 For dinner, I ate some of the shrimp, some filet mignon, some of the sweet potatoes and a caprese salad (sans cheese). 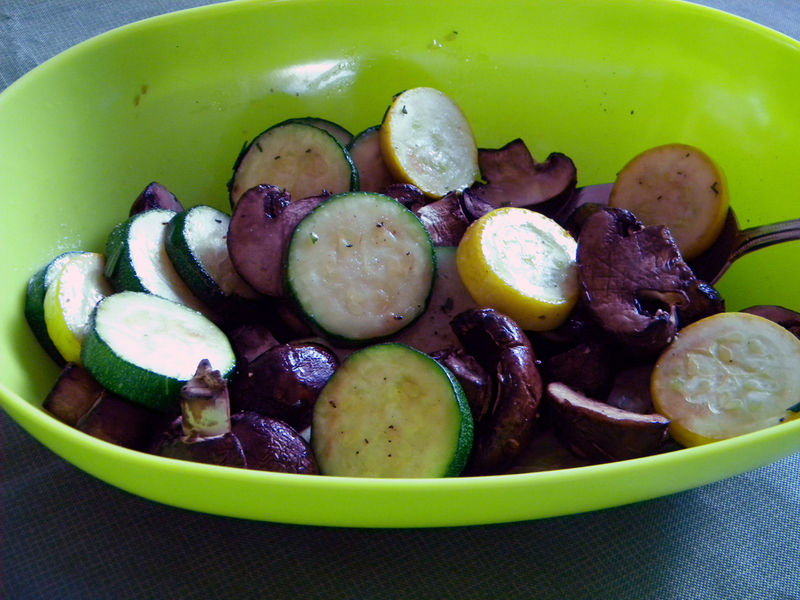 I wasn’t that thrilled with the sweet potatoes — they came out better when I used my grill pan. I’m kicking myself for not grilling the asparagus instead. 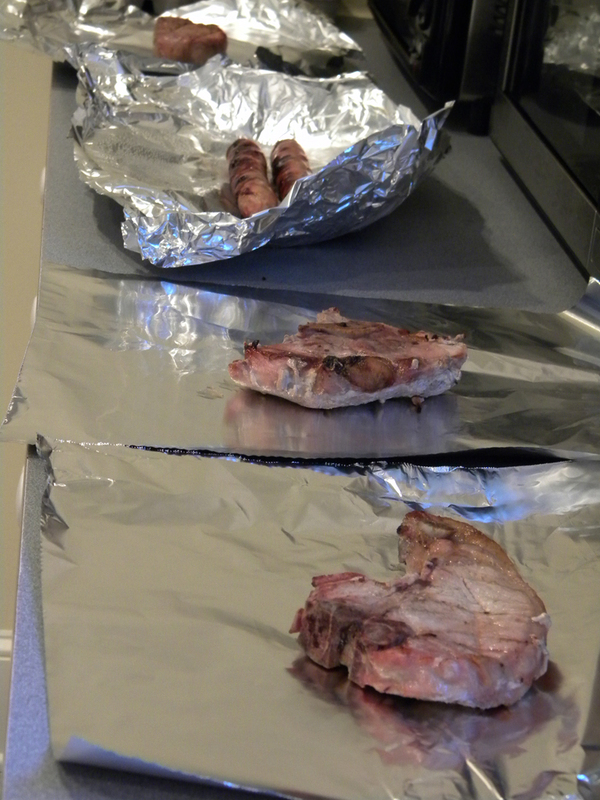 I might pull out the grill pan for that tomorrow. Everything else came out really well though. I still have some cooking to do tomorrow. I need to hard-boil some eggs for my breakfasts this week, grill the asparagus and prep some of the carrots for snacks. I’m planning a steak and eggs breakfast with homemade salsa and I’ll probably have one of the grilling sausages and the leftover shrimp for lunch. Not sure what I’ll do for dinner. Posted in Cooking, Diet, Dinner, Food, Fruit, Leftovers, Local, Lunch, Meat, Salad, Seafood, Side, Sustainability, Vegetable and tagged Amish, asparagus, blueberries, carrots, cooking, eggs, food, peppers, pork, salmon, sausage, shrimp, spinach, steak, strawberries, sustainability, sweet potatoes, tomatoes. Bookmark the permalink. Scrambled eggs with arugula and Old Bay. This blog’s going to be taking a bit of a different tack over the next few weeks. I’ve been advised to try an elimination diet to rule out any food allergies that may be causing me problems. I am already aware of several allergies that I have to some tree nuts and fruits. I’m going to start out this diet eating only meat, veggies and a little fruit (no grains, no caffeine, no alcohol). I’ll have to stick to it for a few weeks before I can gradually start adding things back in. Earlier this weekend, I lived it up, eating pizza, drinking beer and sangria. I gradually weaned myself off of my daily green tea and so far, so good. I haven’t had a headache yet today. I did allow myself two glasses of decaf iced tea. 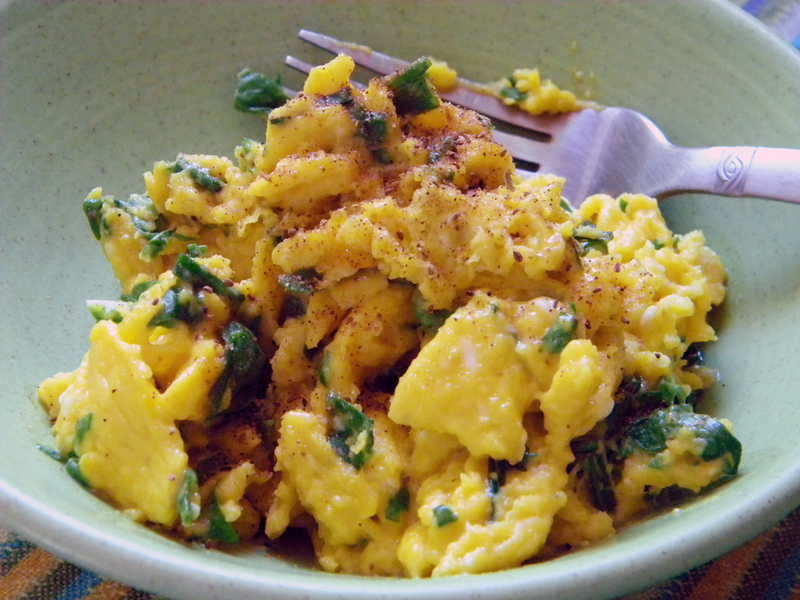 Breakfast was three scrambled eggs with arugula and chives and a sprinkling of Old Bay (above). Lunch was an Italian tuna salad salad from Piazza Italian Market. I picked up some raw pumpkin seeds and roasted them for an afternoon snack. Dinner was herbed grilled chicken and grilled veggies. I nursed a lemonade throughout the day (yep, I’m counting that as fruit). All told, it was pretty easy to follow the diet today. I’m concerned about sticking with it at work. 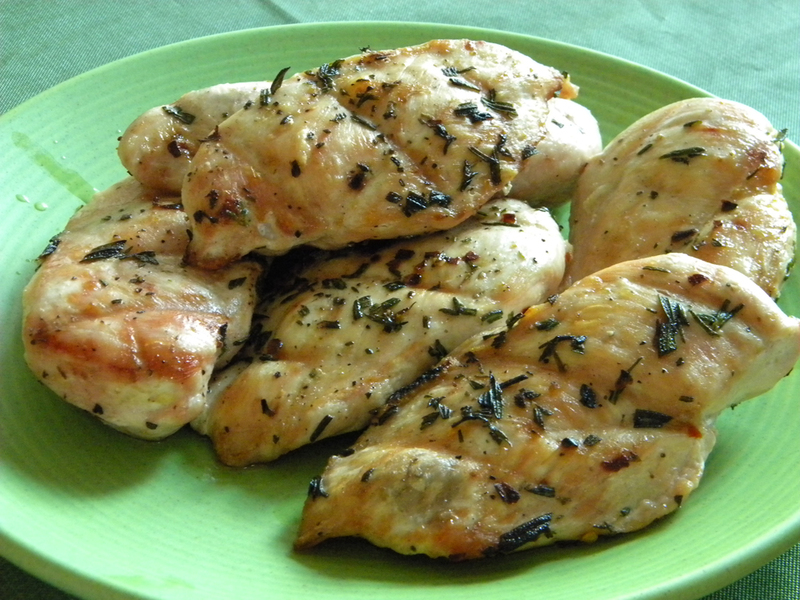 I cooked enough chicken and veggies to take some with me for lunch tomorrow. I hard-boiled eggs for breakfast, which I’ll have with some strawberries on the side. I picked up some green grapes and carrots to snack on, along with the pumpkin seeds. Here’s hoping I can resist the temptation of all the processed foods at the downstairs cafe of my building. I didn’t make it to the markets this weekend because I was visiting friends, but they happened to have a sour cherry tree that was ripe for picking in their backyard. I scored enough cherries to make a pie or crisp at a later date. 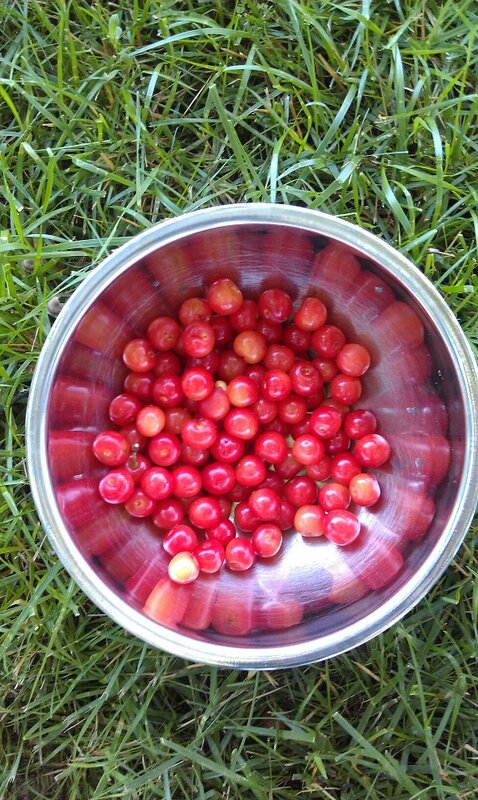 It was a lot of fun picking the cherries with their fam (pitting them, a little less so). We probably picked enough cherries for 10 pies and the tree was still laden. Posted in Beverage, Breakfast, Cooking, Diet, Dinner, Food, Fruit, Grow Your Own, Local, Lunch, Meat, Recipes, Salad, Snack, Sustainability, Vegetable and tagged allergies, arugula, carrots, chicken, cooking, eggs, food, gardening, grapes, Old Bay, pumpkin seeds, salad, squash, strawberries, sustainability, tuna, zucchini. Bookmark the permalink. I had much more luck this morning, making up an Oatmeal Strawberry Green Tea Smoothie. I brewed the tea (8 oz) and sweetened it with honey and then poured it over ice to cool it down. I added that to about a cup of whole strawberries, 1.5 cups ice, 1/2 cup vanilla yogurt, 1/4 c. oatmeal and 1 tbsp ground flax seed. Blended that all up and added a bit more ice to get the consistency right. It still wasn’t as smooth as it might of been with some banana added in, but the flavor and color were much better than yesterday’s experiment with a kale smoothie. I might try adding in a small bit of kale next time. I still think mint would be a nice addition, but didn’t try that today. Posted in Beverage, Breakfast, Food, Fruit, Recipes and tagged food, smoothie, strawberries, yogurt. Bookmark the permalink. Well, I *tried* to make kale smoothie this morning. Actually, I did make a kale smoothie, it just wasn’t very good. I have a bumper crop of kale right now and had been wanting to try using some in a smoothie because that just seems so wholesome. I also had strawberries, vanilla yogurt, and of course, ice. Seemed like I was on the right track. I also wanted to add in some ground flaxseed and possibly oatmeal too. I found an oatmeal smoothie recipe online and started to follow it, throwing in the kale too. I didn’t have the coconut water called for, so I poured in some cranberry juice instead. I didn’t have a banana. I also added some fresh basil, as that pairs well with strawberries. The mixture had the right consistency, but was too tart and earthy. I tried adding some honey, which I’d forgotten to add in the first place. That helped a little, but not quite enough. 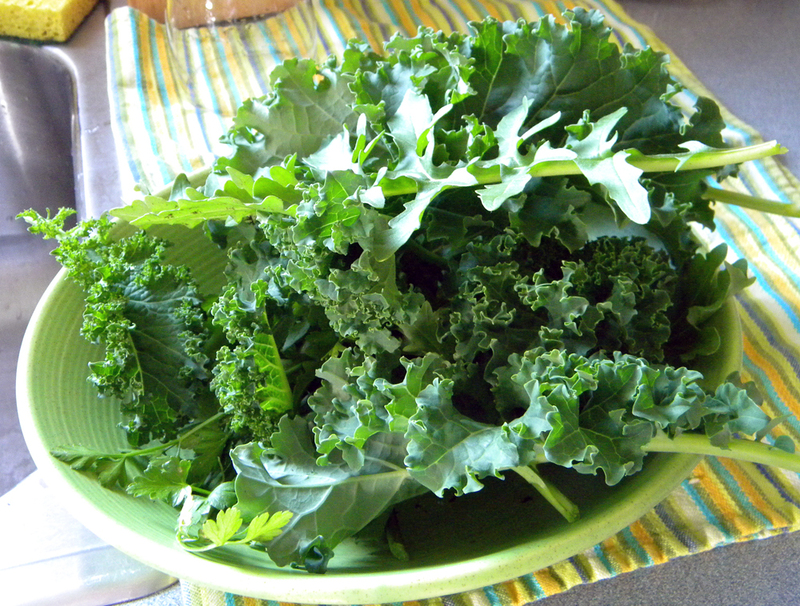 The mixture also had a slightly unappetizing mud color, with specks of green and red from the strawberries and kale. I’ll probably try again, but without the basil, which was a little too strong — I might try adding mint though. Still not sure what I’ll use to try and provide more natural sweetness — any suggestions would be appreciated! Posted in Beverage, Breakfast, Cooking, Dairy, Disaster, Food, Fruit, Local, Recipes, Sustainability and tagged bananas, cooking, food, kale, smoothie, strawberries, sustainability, yogurt. Bookmark the permalink. I spent a lot of time out in the yard this weekend (man, my legs are screaming). 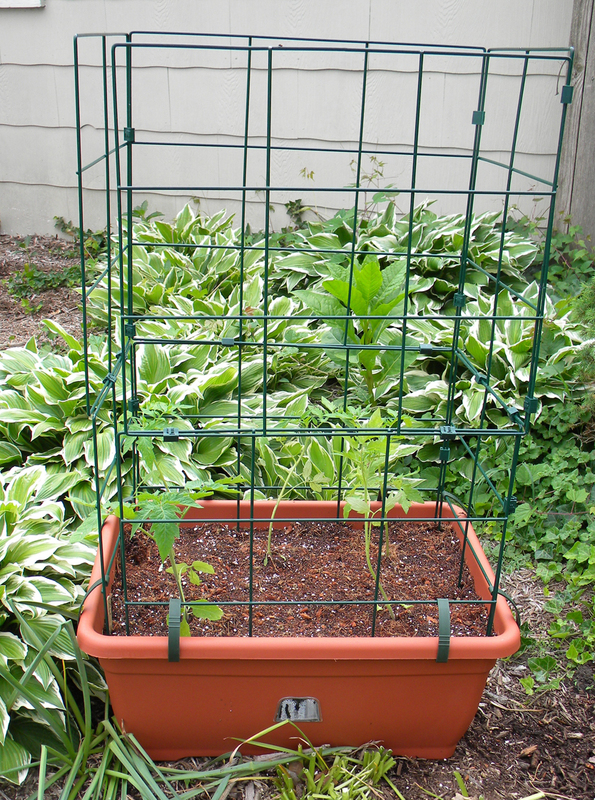 One of the things I did was put together my “Tomato Success Kit” from Gardner’s Supply Company and plant the cherry and Rutgers tomato plants I bought at the farmer’s market yesterday. First, I had to clear out a bunch of weeds and dying spring perennials. 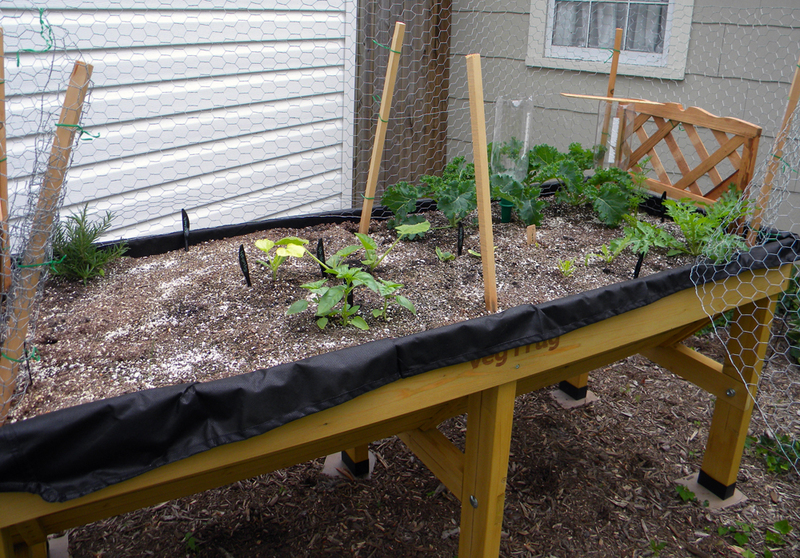 I installed the tomato container in front of the VegTrug where it will get plenty of sun. I appreciate that it came with a cage that will keep out the cats and provide a support for the plants as they get taller. Earlier this week, I transplanted my squash and zucchini seedlings, plus the second planting of arugula. In a last-ditch effort to save them, I moved the one spinach seedling and surviving parsnip, too. I don’t know how that’s going to end, but I don’t have my hopes up too high. Not quite sure what’s going on with the one squash plant that has yellow leaves (they were like that before transplanting). Looked it up and that could be a result of over-watering, under-watering or a type of disease. But the other two squash plants are flourishing. The zucchini’s not doing so hot either, so I seeded some more this weekend, just in case. I complained to one of the farmer’s market vendors that I’ve had a really hard time getting spinach to germinate and he said that for ever 200 seeds he tried to start, maybe only 12 germinated. He thinks it’s something about the weather this year. That made me feel somewhat better. The arugula and kale that I transplanted a few weeks ago are doing really well and I harvested some of both for dinner tonight, along with some parsley. 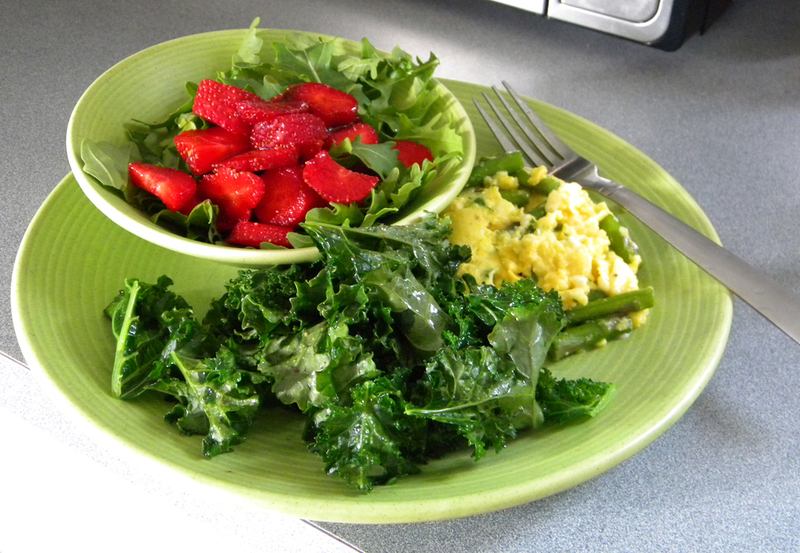 And dinner ended up being chock full o’ veggies — I made scrambled eggs with some of last night’s leftover asparagus (also some grated halloumi cheese), sauteed the kale in olive oil, salt and pepper, and then made an arugula-strawberry salad. 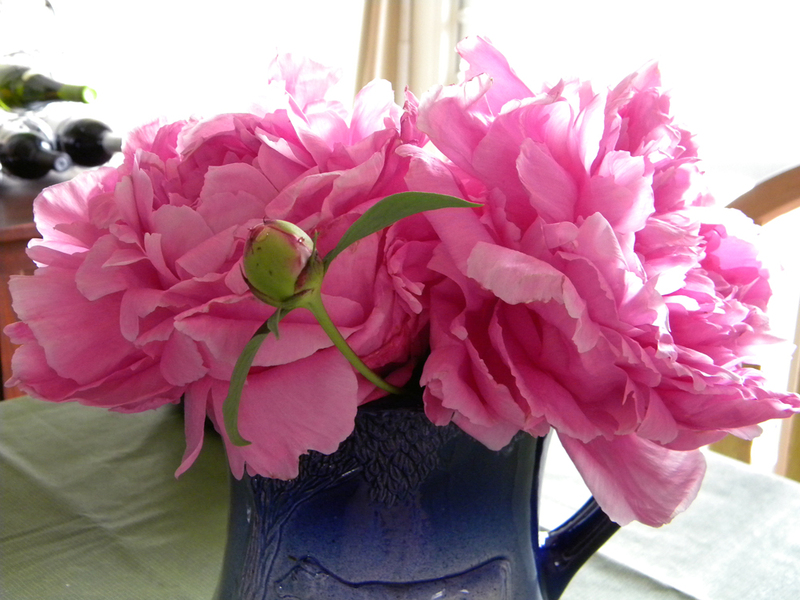 In other garden news, my peonies are in full bloom. I cut a bunch to put in a vase — they smell great too. Posted in Cooking, Dinner, Food, Grow Your Own, Local, Salad, Sustainability, Vegetable and tagged arugula, asparagus, cooking, eggs, food, gardening, kale, spinach, squash, strawberries, sustainability, tomatoes, zucchini. Bookmark the permalink.